Paella is a world-famous dish which originated in the region of Valencia, in eastern Spain. It is now widely eaten in all provinces of Spain, as well as every continent of the world. Like so many other popular recipes, Valencian paella was initially a peasant dish. It originated in its current form in the 19th century and was made with whatever ingredients were available when the pot was heated over the open fire. Today there are as many versions as there are cooks from vegetarian to seafood and mixed paellas. Regardless of the kind you prepare, the undeniable fact is that rice is the key to making a great paella. 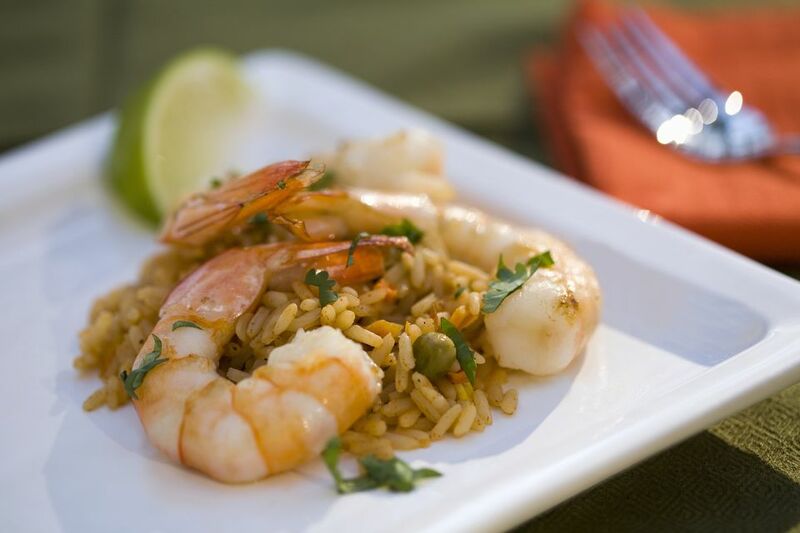 After all, paella is essentially a rice dish, and you want to choose the best variety. Rice is perhaps the oldest crop in the world, with records of its cultivation dating back to 2500 BC in China. Cultivation of rice gradually spread throughout the centuries to India, then Greece, and around the Mediterranean and North Africa. When the Moors arrived in Spain in the 8th century, they brought with them a variety of new foods, including rice. The Spanish word for rice is arroz, which comes from the Arabic word ar-ruzz. They also brought technological advances, such as irrigation systems, which helped their kingdoms become productive agricultural zones. Over the centuries, the cuisine and culture of Valencia developed around rice. Valencia rice has become so highly valued that recently two Denominations of Origin (DO) for rice grown in those areas were ratified. The Denominación de Origen Calasparra was ratified in 1986 and the Denominación de Origen Arroz de Valencia in 2001. Bomba: Bomba, also called Valencia Rice, is a short grain, almost round rice, with a pearly color. It absorbs three times its volume in water as opposed to the average rice grain, which absorbs only twice its volume. This means it absorbs more flavor and does not stick together. For these reasons, bomba rice is highly prized by cooks. Another difference with the bomba variety is in the way it expands during the cooking process. Instead of cracking open along with the length of the grain, it breaks open crosswise and as it cooks, and it expands like an accordion until it reaches three times the length of the raw grain. Senia and Bahia: Senia and Bahia short grain rice varieties, similar to bomba that also absorb more than the average amount of liquid, and retain a creamy texture after cooking. They are the two most widely grown varieties of rice grown in Spain. Calasparra: Calasparra short grain rice is grown in the area around the town of Calasparra, Murcia. Rice grown in the DO of Calasparra is called Calasparra. However, both Balilla X ​Sollana and Bomba varieties are cultivated there. Rice varieties like Bomba, Calasparra, or other high quality, short or medium grain rice are readily available for purchase in Spain. However, if you are in the USA, purchasing these varieties can be difficult since they are only available via the internet and at gourmet and ethnic grocery stores. So, use medium or short grain rice. One alternative that produces wonderful results in Spanish rice dishes is Calrose rice. The Calrose variety is short grain rice, developed by the Rice Experiment Station at the University of California, Davis from the japonica variety. It was released to growers in 1948​ and has been growing in popularity ever since. It is now widely grown in the Pacific Rim and Australia. Calrose is readily available in supermarkets in the USA and can be substituted for the Spanish varieties.